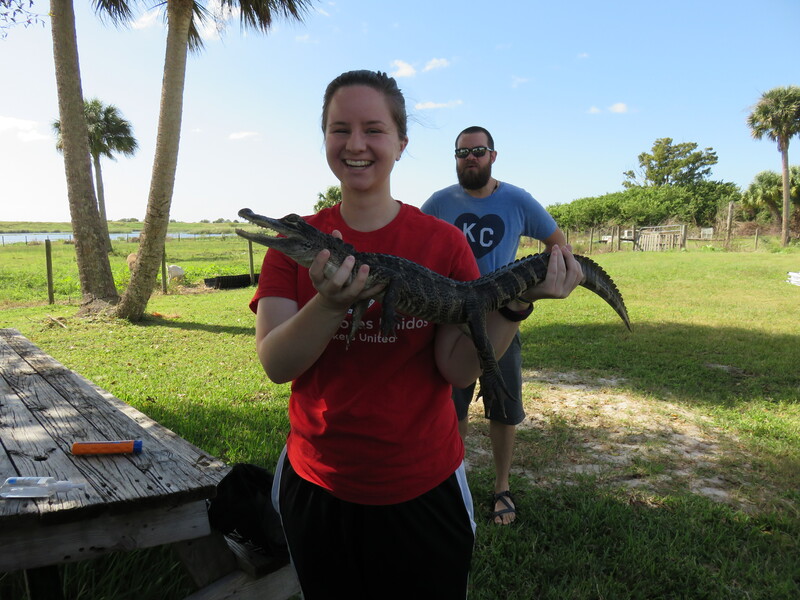 Holding the 10-year-old alligator, Duke, near Lake Okeechobee during our YAMM service retreat to Pahokee, FL. Two weeks ago, I traveled to Pahokee, FL for our service retreat with YAMM. We volunteered at the GAP food pantry/thrift store and went on an airboat ride in Lake Okeechobee. I got to hold a 10-year-old alligator named Duke. I went to South Beach for the first time. It rained a little bit, but it was beautiful. I’ve missed the waves. I volunteered at the butterfly garden at Deering Estate through HandsOn Miami the following Saturday. On Tuesday, October 27, we held our October clinic. South Florida JFON meets with current clients throughout the month, but we hold monthly clinics to welcome new clients, complete intake forms, provide advice and counsel, and determine whether or not we can take on their cases. That was the best part of my week. I met with two UACs (unaccompanied minors) from Guatemala, ate taquitos, spent time with our wonderful volunteers, and then met with another teenage client from Spain. Our car overheated on the way home from work last Wednesday. It started to smell like something was burning, so we parked it at a bar near the public busway, and we took the bus the rest of the way home. (It’s times like these when I really miss DC’s transit system. Our office is ~5 miles away from the closest bus stop, so we have to drive to work every day.) The bar owner allowed us to keep Junk (our car) there overnight, and Heidi/AAA towed it on Thursday. We picked it up on Friday after the transmission and misfiring third cylinder were fixed, the tires were changed, and the front breaks were replaced. I made sopa de pollo with the yucca, red cabbage, carrots, corn, and suntan peppers that we got in our Farm Fresh Miami produce box last week. It was similar to what my host mom made in Chile. I went to court twice to interpret for Spanish-speaking UACs in the pro bono room before and after their master calendar hearings. I volunteered with Branches during their Thanksgiving Client Call Day. I made over 100 phone calls to their Spanish-speaking clients to confirm their addresses and the number of free prepared meals they want delivered to their homes on Thanksgiving. Since it was Halloween, my housemates and I watched Hocus Pocus that night and passed out candy to the few trick-or-treaters who came. So many unexpected things have happened, yet I really feel at peace. Life is not perfect; God is still good. What a wonderful sentiment/tagline, Emily!